UK-based technology company Renovare Fuels has been awarded support by Innovate UK for aviation fuel testing through the Sustainable Aviation for Clean Growth programme. Above: Renovare CTO Devin Walker standing in front of Renovare’s Demo Unit. 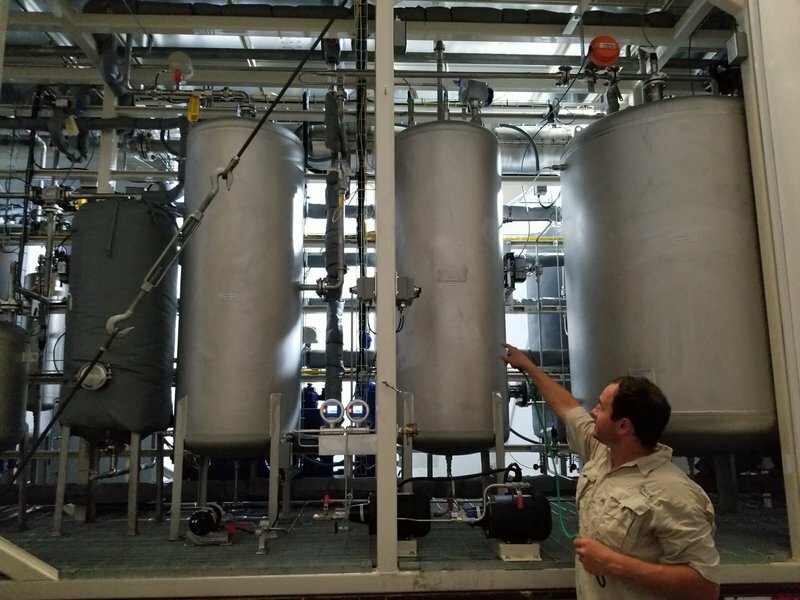 The company has developed a technology that converts waste into a biofuel that could replace traditional fossil fuels. Fuel standards outlined by the British Ministry of Defence state that turbine-engine aeroplanes must use fuel that is compliant and certified to meet the ASTM D1655 standard. Renovare Fuels expects that, following the testing programme with Innovate UK, the company’s fuel will be approved as a blending agent, suitable for use in commercial aircraft. Governments across the globe are putting pressure on the aviation industry to lower emissions and meet the targets outlined by the Carbon Offsetting and Reduction Scheme for International Aviation (CORSIA). The initiative states that the aviation industry should aim to achieve emission free growth from the year 2020 onwards. Sustainable Aviation predict that biofuels, like those developed by Renovare Fuels, are expected to account for 15 to 24% of the reductions required to achieve this target. By completing the testing programme, Renovare Fuels hopes its product will be recognised as a valuable and cost-effective alternative, to both diesel and aviation fuel. “Many airlines are hesitant to adopt alternative fuels because of the longstanding issues that have been reported and not addressed,” explained Dr Kris Anderson, project manager at Renovare Fuels. “For biofuels there are two primary concerns, the first being the formation of paraffin crystals at low temperatures and the second being the formation of carbon deposits on the fuel injection nozzles. “Carbon deposits can form at high temperatures due to thermal decomposition of various types of component that may be present in the fuel and may lead to blockages. In extreme cases this could lead to engine failure, because the fuel injection systems in planes can reach very high temperatures, it’s important that fuels like ours can withstand extreme temperatures. The programme aims to identify any problem components in the fuel, so that adjustments to the process can be made to eliminate them. Support from Innovate UK has already begun, and the first stage of testing will commence next month. Both phases of the programme are expected to be completed by 31 January 2019. The company has already outlined plans to increase its fuel production output to produce 250 million litres annually by 2030. Working with Innovate UK should help the company expand its market and help more airlines confidently transition to sustainably sourced biofuels.